Can you do an MRI with implants teeth? Today, dentistry has become more affordable, efficient and developed medical services, so people become more engage in the prevention and treatment of their teeth. However, the reason to do an MRI can occur even when there are braces, dental implants or metal-ceramic crowns. A lot of people saw the films during the MRI the person under the influence of the device «pulled out» the pins, teeth or stripped of metal-containing the tattoo from the skin. Naturally the question arises: is it possible to do such a study, after dental intervention and the installation of dentures? Will try to dispel some of the myths about this study and to determine whether there is a real danger of the survey on magnetic resonance imaging with a tooth implant. Paramagnetic and ferromagnetic materials – is there a difference? From school physics course known that all metals are divided into three types: ferromagnetics, diamagnetics, paramagnetic. Interact with the magnetic field of all three types, but is particularly strong ferromagnets. They heat up and can move under the influence of a magnetic field generated by the MRI machine. The fact that in MRI, the magnetic field strength is such that I can only move the non-fixed elements. For example, the fragments of the bullet or surgical clips on the heart or the brain which fix the soft tissue. Pins implants teeth to shift can’t! Thus, this is another myth about dentures, and MRI. As mentioned above: magnetic field acts only on the ferromagnets. In a General sense of the word ferromagnetic is all products made of steel, and the paramagnetic – titanium. The ferromagnetic materials are strongly heated, depending on their size. The longer the plate or the pin, the more it heats up under the influence of the magnetic field of the MRI scanner. Some experts believe that dangerous products are heated only over a length of twenty centimeters. 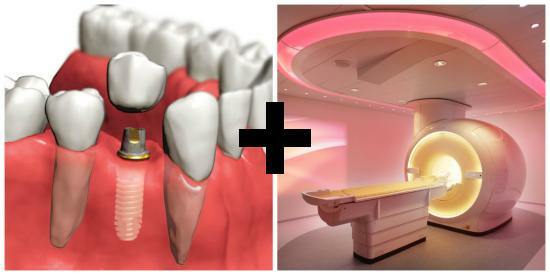 Dental implants are not warmed up during the MRI! 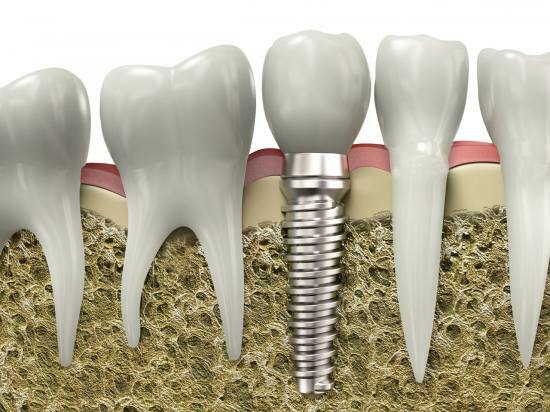 If you still worry that the implant will be warmed up during the study and cause pain, calm. All patients before the procedure, give the button you can press if there is any discomfort or pain. So, as we found out, dental implants are not dangerous and are not a contraindication for MRI. Nevertheless, there are some nuances that they bring to use this method. Magnetic resonance imaging of the body part where the implant was installed – not advisable! That is, when installed the bracket systems of metal-ceramic prostheses and implants is to do an MRI of the head, but it makes no sense, as the images they will fonit and the doctor can’t understand. Metal construction in the place of their implementation, create so-called artifacts, that is, accidental discoveries, which sees the doctor. Such artifacts are irrelevant to the disease, which the specialist tries to detect on MRI. In addition, they may mislead him, forcing him to put the wrong diagnosis. When installed dental implants, you can do MRI other parts of the body: chest, pelvis, abdomen, limbs and so on – it would have no impact on the results of the study! We dispelled the myths relating to magnetic resonance imaging and dental characteristics of patients. To believe everything we see on the screen or write in advertising – not worth it, because you can ask the attending physician! MRI of the ankle: that will show which is better? Can the MRI be wrong in the diagnosis?